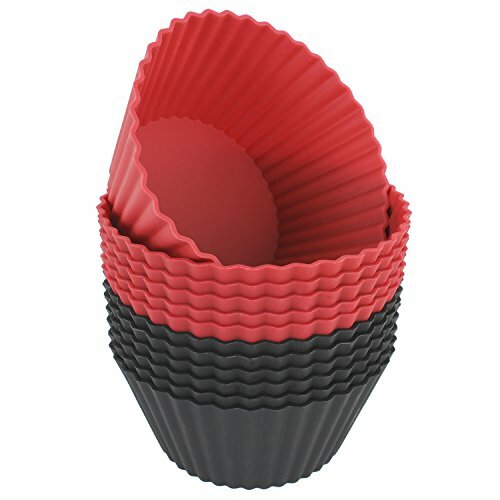 Create your own special desserts or homemade soaps with the Freshware CB-320RB 12-Pack Silicone Jumbo Round Reusable Cupcake and Muffin Baking Cup, Black and Red Colors. This baking cup is constructed with 100% pure, premium quality food-grade silicone, which meets US FDA and European LFGB safety standards (BPA, PVC and Phthalate FREE). Simply pour your favorite recipe in the cup, prepare, and cool completely. Then turn it upside down, this flexible silicone cup offers a non-stick surface that allows the baked goods to pop right out with a little push from the bottom. Remember to place the silicone baking cups on a baking sheet for easier positioning and removal. Cup Size: 3.8 inch top x 2.6 inch bottom diameter x 1.7 inch depth. Volume: 12 x 7 oz, Total 84 oz. Includes 12-cup. Many customers have found creative ways to use Freshware silicone baking cups (depending upon the shape) to create delicious homemade cupcakes, muffins, brownies, cheesecakes, bento boxes, chocolate and snack bowls, frozen baby foods, gelatin, ice creams etc. Other customers use the molds in unique ways to create clays, resin casting, candles, soaps and more. All Freshware silicone products DO NOT have Chemical Coatings and are Pinch Test Passed. Our silicone mold handles temperature from -40 to +446 degrees Fahrenheit (-40 to +230 degrees Celsius). Reusable for up to 3,000 uses, our molds save money by eliminating the need to ever buy disposable paper liners again. Safe to use in the Oven, Refrigerator, Freezer, Microwave, Steamer and Dishwasher. Top rack dishwasher safe, but hand washing is recommended to extend the life of the product. What Is A Pinch Test? Cheaper brands often use plastic fillers in their silicone products, so it is not safe for high-temperature baking. Pinch and twist a bit of the silicone, if it turns white, it’s got fillers as 100% pure silicone will retain its color. If you have any questions about this product by Freshware, contact us by completing and submitting the form below. If you are looking for a specif part number, please include it with your message. 3 x Silicone Pet Treat Molds. Dog Paw, Bone and BONUS Heart mold. FREE healthy treats RECIPE CARD included in set.